The war between culture and nature was a popular theme in art exhibitions a few years ago. The victory supposedly won by culture (according to theorists of postmodernism) has been re-adjudicated lately, with nature making a strong comeback. As the costs of climate change become increasingly evident, it’s equally clear to all but the most fundamentalist of zealots that Mother Nature, like God, is not mocked. Three Bay Area artists take nature and natural forms and materials as the stimulus and subject of their work in "Excerpts from the Natural World." That title suggests literary quotation, and the belief of medieval theologians in the divinity of Creation: that ‘reading the book of nature’ was as important as poring over scriptures. Contemporary secularists, of course, favor empirical, fact-based reality over moral lessons from ancient sky gods or tribal chieftains endowed with superpowers. Sarah Hinckley’s paintings, four medium-sized oils on canvas and six unframed works on paper in watercolor and gouache, are abstractions that synthesize her impressions of specific locales — the marshes and ocean at Cape Cod, the New York subway, the color of a jacket, recorded in notes and a journal — with an intuitive approach shaped by memories of Monet, Rothko and Agnes Martin, painters who worked from nature to various degrees of abstraction. Hinckley’s lyrical paintings (standing in the sun, and the wind whispers, and you don’t know what you feel), are vertical in format. Each is comprised of three or four horizontal bands of high-key color, suggesting land, water and sky, with some of the bands containing silhouetted leaf forms. They’re composite landscapes that go beyond realism, with form and color simplified and clarified by memory and process. Esther Traugot works with dead bees (found in beekeeper hives), barnacles, eucalyptus caps and cherry pits. These small found objects are encased in golden-yellow hand-crocheted jackets or cozies. The sheer number of these tiny articles of clothing is obsessive and perhaps excessive, indeed absurd, but in an esthetically effective way. We’re all aware that honeybees are threatened, and that human agriculture is potentially threatened too, so whatever waggle dance it takes to alert the human hive is good. 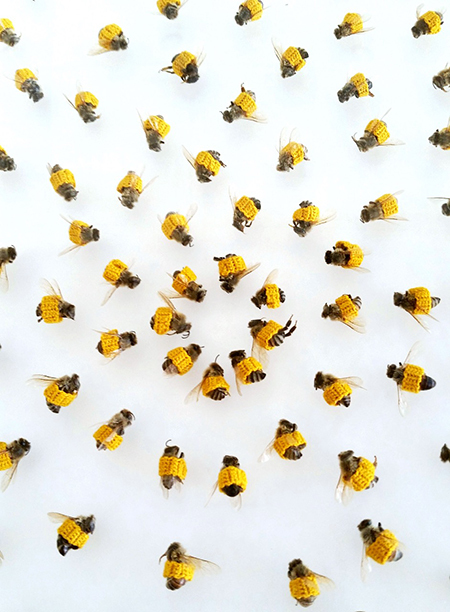 In "Huddle 2 (Workers)," Traugot arrays 150 dead bees in their pollen-yellow burial robes beneath a glass dome, suggesting an astronomical aspect to entomology. In two other piecea, she literaiizes the 1920s slang expression, ‘bee’s knees,’ meaning delightful or excellent, presenting the insects’ legs, laden with pollen. In another retake on proverbial wisdom, "Life is a Bowl," Traugot weaves tiny yellow casings for cherry pits, giving them the appearance of microscopic animals. “Caps," the wall installation, does the same for button-like eucalyptus caps. Traugot’s ritualistic remediations may be an ironic apology to nature for human follies, but also a gentle chiding of our own busy little tribe of individualist drones.